We’ve always been a creative bunch at Kew Primary but things are about to ramp up! KPS’s first annual art show, Splash, is fast-approaching and over the next few months expect art, art, art to be the topic of conversation and activity. 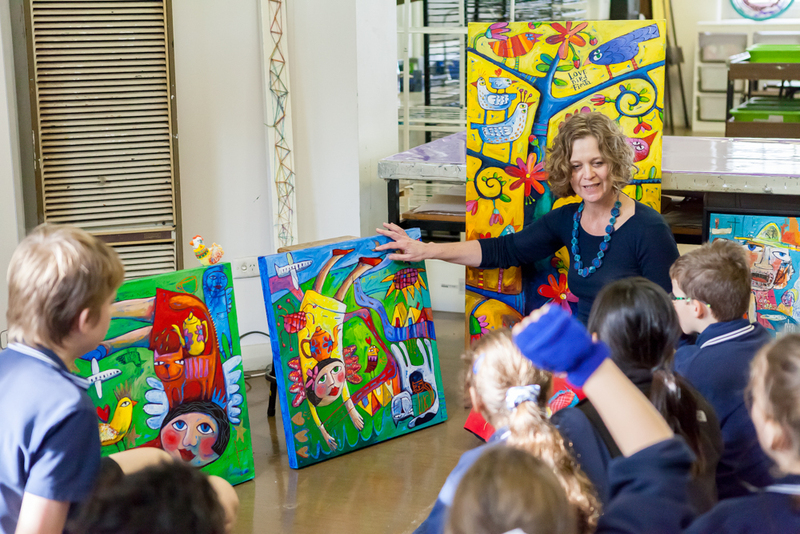 This week, Claire Bowers from the Splash organising committee tells us about artist Sara Catena’s visit with grade fives. 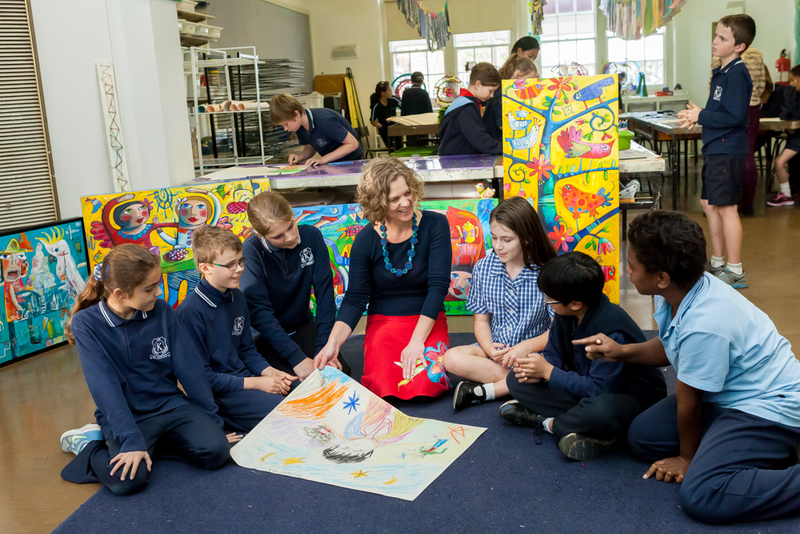 Grade Five students entering the art room on Tuesday 10 June were greeted with the sight of five joyful and exuberant paintings whose vividly colourful subjects seem to dance off the canvas. Rosy-cheeked women with angel wings drink tea with their friends; birds and cats dance across a perfectly blue sky. Sara is one of the ever-increasing number of talented artists who will be taking part in Kew Primary School’s first art show, Splash, to be held in October this year. 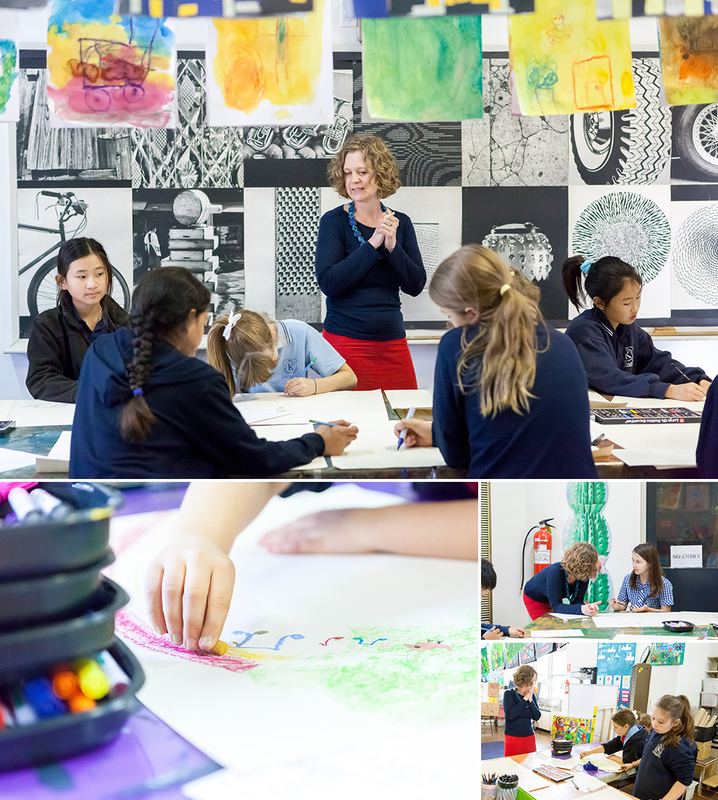 Sara was invited into the school to run a hands-on workshop with the Grade Fives, to help inspire them in their own approach to art and encourage them to get engaged with the show. Sara certainly kept her audience captivated, children and adults alike. As she explained what inspires her – personal stories transferred to canvas using a wide range of materials including embroidery, paint, pastels and even gold leaf – students eagerly asked her many questions about her technique, how and why she chooses her subjects and even what her favourite colour is (yellow). Her passion and energy for creating beautiful and uplifting art was infectious and when she encouraged the students to come up with their own stories around the theme of ‘how I have changed’ and start sketching them out, the results were quite remarkable. Sara noted the high calibre of creative talent among the students; Kerry Lomas and the other teachers should be proud. This entry was posted in Events, Fundraising, Learning, Students and tagged art, art teaching, Splash Art Show by Kate W. Bookmark the permalink. I’m ready to jump in! How many sleeps till 17th Oct?!!!! Really cool and creative for kids like me draw and creative art!! !